Quite an atypical "M" machine. 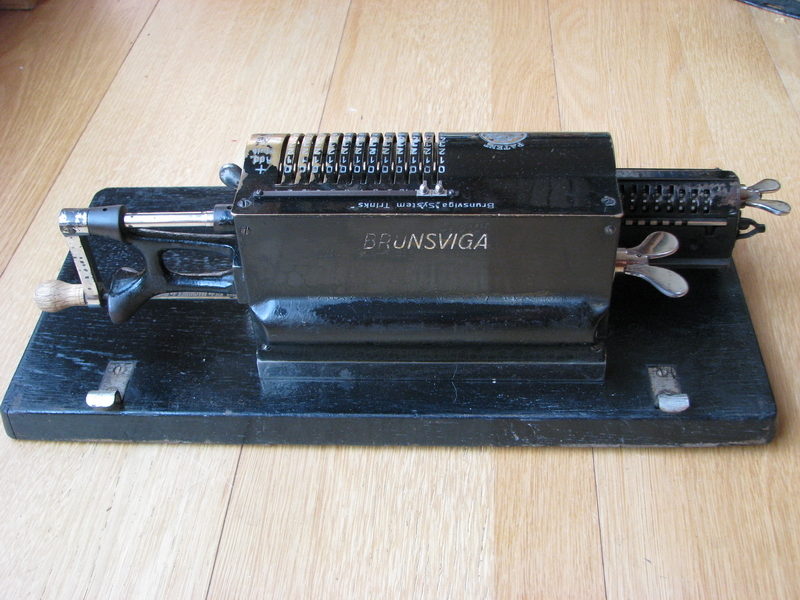 The M in the model designation of Brunsviga used to stand for "mini", i.e. 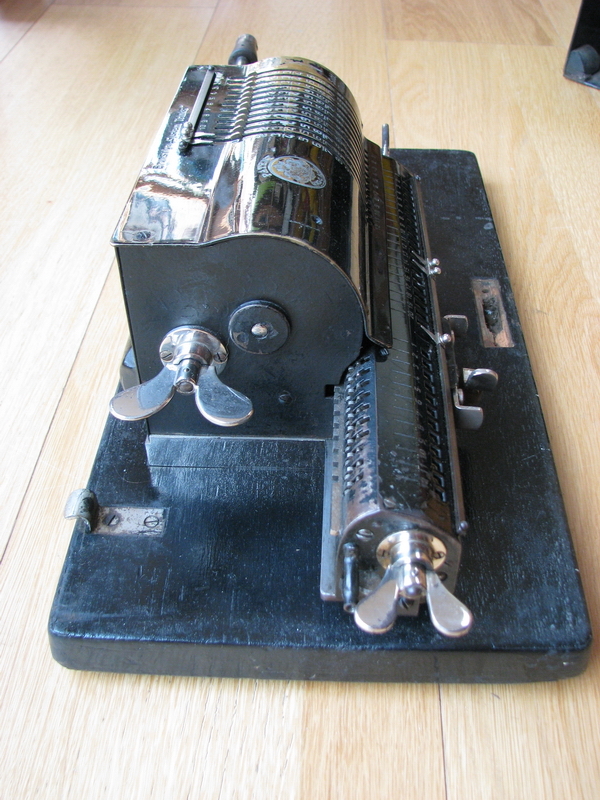 a smaller version of a machine that was built in the standard size, see e.g. the B vs. MB, A vs. MA, and indeed the D vs. MD. 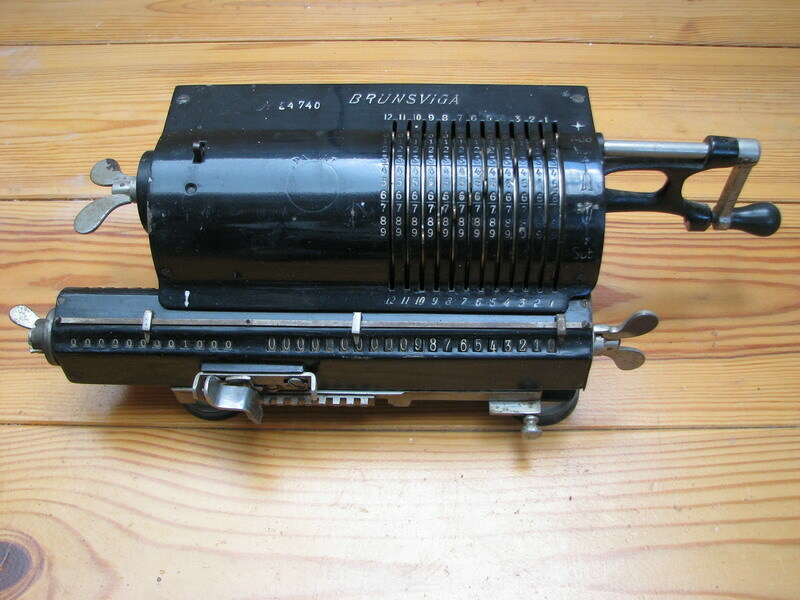 However, I never really anticipated the sheer size of a Brunsviga D.
The pinwheel cylinder contains tens' carry teeth, and since the timing of the tens carries is important (you want the carry from every lower value digit to happen before the next-higher digit), the tens' carry teeth are organised to that they run in a spiral shape around the pinwheel cylinder. However, you only have half of the pinwheel cylinder to do that in, as the tens carry teeth for the other direction also need to do their thing. Then inbetween the tens carry teeth, you have to have a provision for a reset of the tens carry levers in the carriage, to prevent these levers carrying twice over the course of one revolution, once for each tens carry tooth they encounter on the pinwheel cylinder. Then finally, you need to make sure that all the additions or subtractions for a particular digit are done before arriving at the carry position. For a Brunsviga A and B, with 9 input digits, this just works out. The tens' carry teeth spiral towards each other on either side of the pinwheel pins until in the last pinwheel disk, there is just enough room for the reset device inbetween. 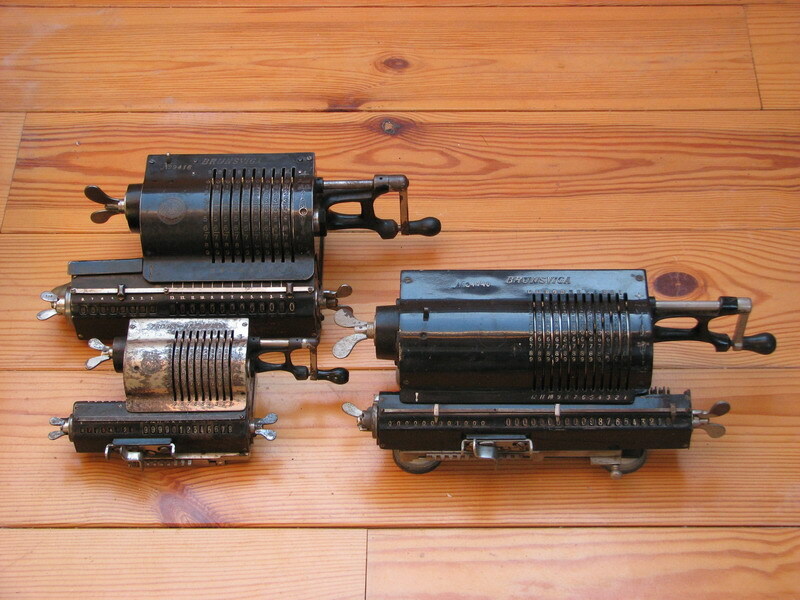 If you want more input digits, there is only one solution for the tens' carry - you need to make the pinwheel cylinder larger with respect to the size of the carriage, to provide more room for more sequential tens' carries. A Brunsviga D is truly huge. This is probably the reason why only one, or at least very few, were ever built. You can compare the size of the MB to the B, and of the MB to the MD in the following picture. You can see that the carriage of the MD is "M" sized, whereas the pinwheel cylinder is nearly as large as the one of the full-size B, but note the setting positions, that are a lot closer together. They sold the MD with a large handle, and a special longer handle casting, to prevent the operator from hurting his or her hand on the longer carriage. I think the full size Brunsviga D, which resides at the Braunschweigisches Landesmuseum, must hold the record for the largest pinwheel calculator in existence. This example is a little worse for wear, having been repainted as so many have been, one wing broken off the counter clearing nut, and the input clearing wingnut also bent up. Perhaps another candidate for restoration at some point. Interesting to note is the knob on the bottom right of the machine. For all I can see, it only serves to hold the machine when shifting the carriage. The serial number is 24740, lower by almost 15000 than the earliest known Brunsviga MD so far. It has the "unlock" for the direction indicator, allowing to turn back the handle when necessary, which later machines no longer have. 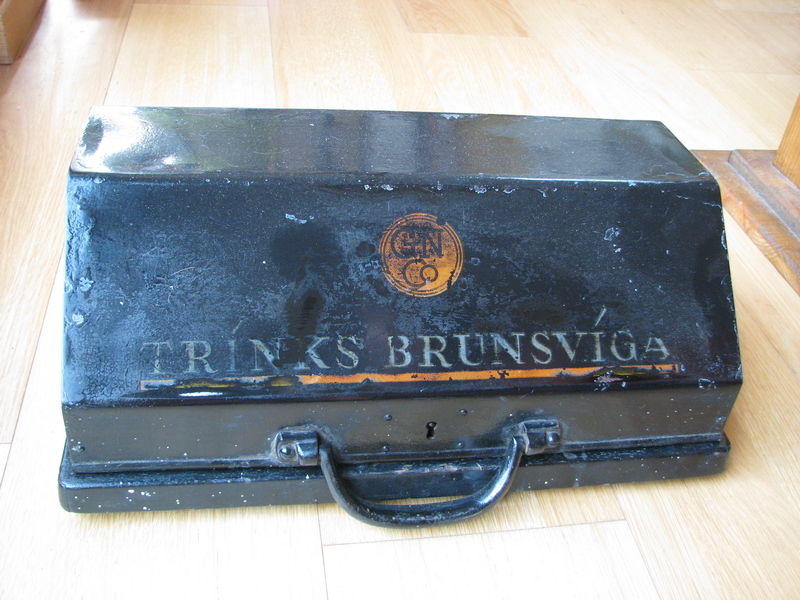 It also has simply "BRUNSVIGA" stamped in the top plate, not mentioning Trinks. 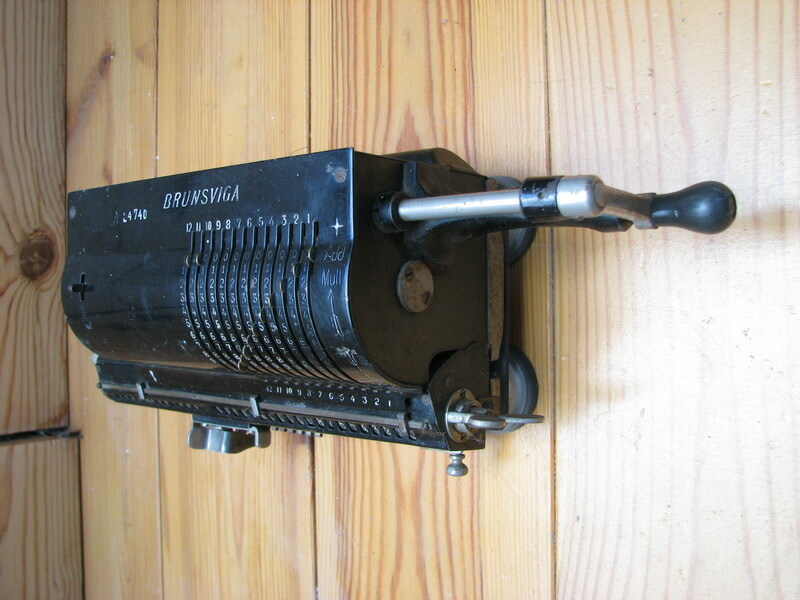 The Brunsviga D in the BLM is numbered 7700. In the summer of 2015, I saw an advert for another Brunsviga MD, which belonged to an American from California, a military man who was posted near Mons for NATO stuff, with his family. 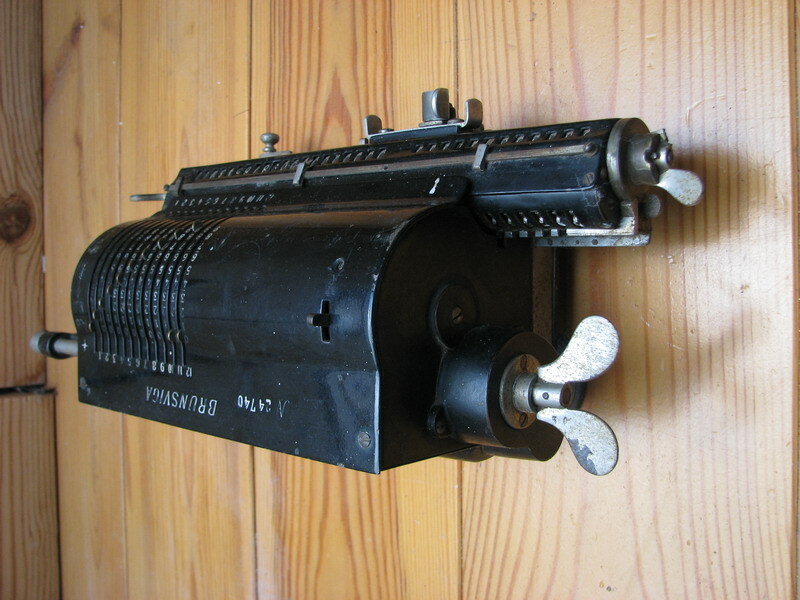 They bought the calculator at a local house sale, had it for a while and now felt it was time to sell it on. He showed up with his daughter at the agreed meeting point in Mons. The previous owner (who's name and address were conveniently printed on a small sticker outside the case) was a Congo-born descendant of major Leon de Bongnie from Tournai, a Belgian war hero and regiment doctor in the Great War, who died from a shell explosion in October 1914. His grandson Jean-Pierre had (and used?) the machine. 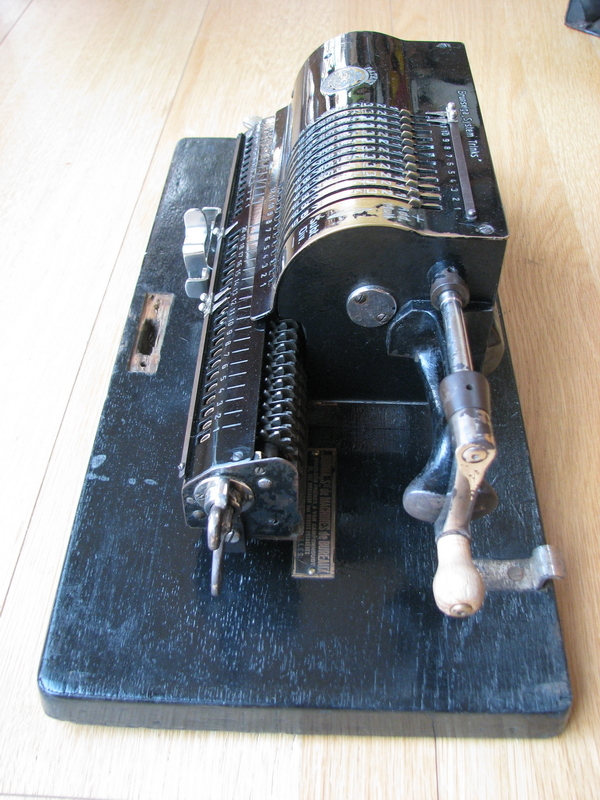 It is uncertain whether the machine actually had been to Africa - it may have been bought in Brussels by his father in the mid-20s (build date is 1923), or it may have been bought afterwards, second-hand. As I got it, the case looked quite bad, but luckily it was still present, even if the locking plate had been broken out to open it. Usually they protect the calculators quite well if they are kept closed. You could see through the rough matte black paint on the case that the original lettering and logo were still there, in relief, under the paint. I simply ended up wet sanding the top layer off, being careful not to damage what was below. And lo and behold ... it looks surprisingly well! 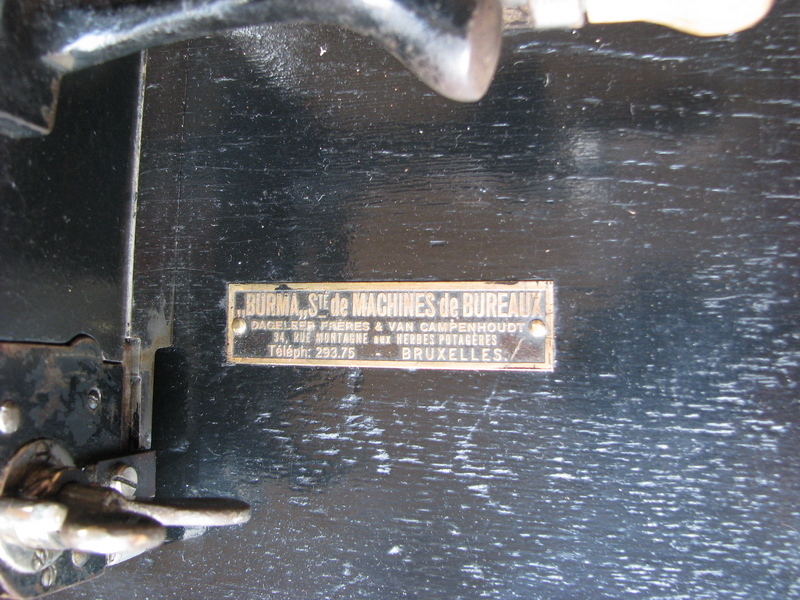 The machine itself was sold in Brussels by the Société machines de bureaux "Burma", an outfit I have another machine from, also possibly second-hand, because it dates from the early 1920s, and that is a bit early really for the previous owner to have acquired it (hr was bron in 1932 - perhaps his father?). 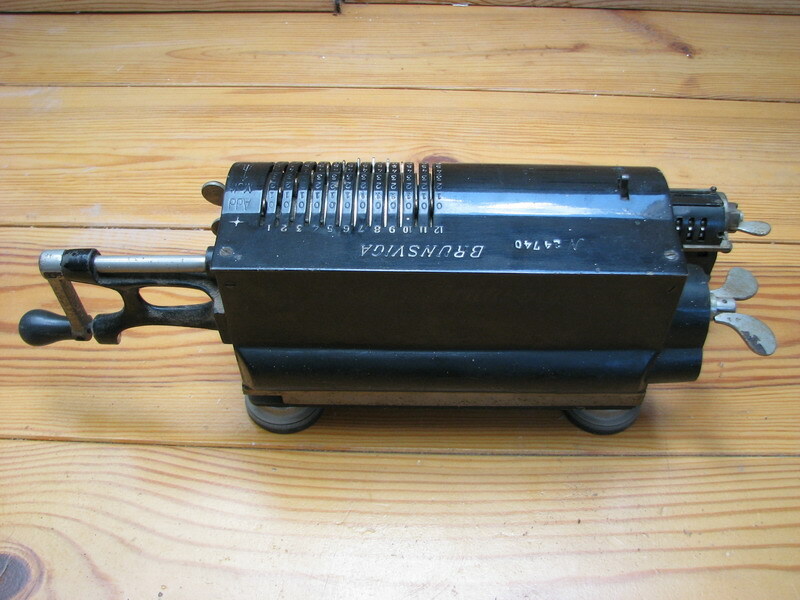 Something happened to the crank handle, which had to be repaired - I turned a new grip from wood. For the rest, the machine looks surprisingly decent.